“This hunger strike is for everyone in this situation, don’t leave us alone in this fight for life, we are human beings that deserve the respect and dignity to be treated,” says hunger striker Catalina Arroyo, aunt to brothers Elfego and Lorenzo Arroyo, left in blue shirt. Sonia Lopez, right, is another of the hunger strikers. Her son, Jorge Mariscal, needs a kidney transplant but is unable to get medical attention due to his legal status in the United States. 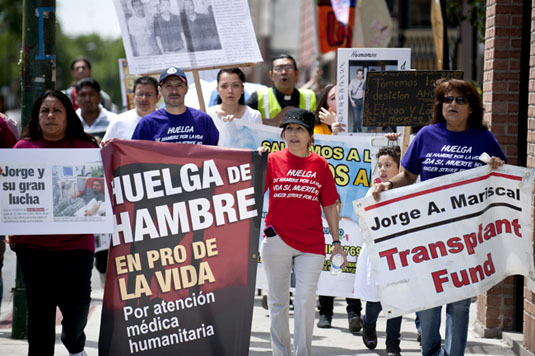 A “Walk for Life” march by hunger strikers and their supporters headed to UIC Medical Center Wednesday to protest what the demonstrators say are discriminatory practices by the hospital against undocumented immigrants. Specifically, protesters are upset that some of their friends and family have been denied spots on the transplant waiting list because of their status. Sonia Lopez, Hilda Burgos, Catalina Arroyo and Fr. Jose Landaverde have been on a hunger strike since June 3. Lopez’s son lost a kidney to cancer and is in need of a transplant. Lorenzo Arroyo, 36, and his brother Elfego, 38, both need liver transplants to cure the deadly liver disease amyloidosis. Their dire situations are what sparked the hunger strike and demonstrations. The Rev. Luis Alvarenga of Latino Mission UCC joins the community in a march demanding UIC attend to undocumented patients. "I am here in solidarity for those who do not have access to medical services," said Alvarenga. "Yes to life, no to death!" "I am here to fight for my son's life" said Lopez. "I am going to do whatever it takes, even if it means taking my own life." The "Walk for Life" enroute to UIC Medical Center. Lorenzo Arroyo had to end his hunger strike for medical reasons. But he still marched with the community to UIC Medical Center. "I am here to fight for myself and my brother's life," Arroyo said. "I hope that the hospital hears us and attends to us." "Walk for Life" headed down to UIC Medical Center to demand the hospital explain why it refuses to treat undocumented patients. Lopez, center, is helped by her sister and Elfego Arroyo, as they walk towards UIC Medical Center. The Rev. Jose Landaverde, a hunger striker, said during a press conference in front of the UIC Medical Center that it's a sin to not accept a person for medical attention, and that everyone deserves care regardless of their legal status in the country. Marchers gather in front of the UIC Medical Center. Sonia Lopez, left, Catalina Arroyo and Elfego Arroyo during a press conference at UIC Medical Center. “This hunger strike as well as the walk for life is gaining a lot of support because of the ethical issues involved. We will not end the strike until these medical institutions sit down and talk with us,” Landaverde said. Landaverde and Arroyo in front of the UIC Medical Center. Dennis Kosuth, RN, at Cook County Hospital supports medical attention for everyone regardless of their legal status, during the press conference at the UIC Medical Center. Landaverde gives a letter to Alfred Pate, executive assistant to the CEO of the UIC Healthcare System, asking UIC Medical Center board of directors to accept undocumented patients and give them a chance to live.